I have long been waiting to read a book by Susanna Kearsley and I savored this novel page by page. Read on to see what I thought of this author's latest novel. I have long been waiting to read a book by Susanna Kearsley and I savored this novel page by page. Although the story build-up is slow, it's what ended up making me like this book all the more. Best of all, I loved the Canadian history and how it unfolded to reveal how the Colonial Wars between the British and French colonies affected the local people. The setting was familiar to me as I live in Montreal, Quebec and have been to some of the places mentioned in this book. 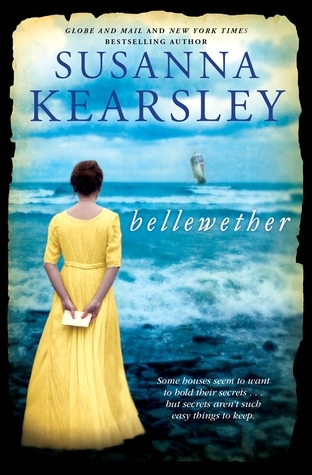 Bellewether is a dual timeline story alternating between the present and 1759, with exactly the same setting and events unfolding in the same house but during two different time periods. In the present we have Charley who is the new curator of the Wilde House Museum. She has a "meh" relationship with her boyfriend and has moved in with her college-age niece who is now alone since Charley's brother died. Charley loves researching the history of the Wilde house and her discoveries follow the story that takes place in 1759 when the Wilde family take in two enemy French officers, POWs on parole of honour. Lydia Wilde is the only daughter in a house of men (her mother died) and she and French-Canadian lieutenant Jean-Philippe de Sabran are not happy to be in the same house together. The presence of the French officers further strains the already tense atmosphere by Lydia's youngest brother who also fought in the war against the French. This is where Kearsley's writing talent comes into play. She creates a tense situation and realistically builds on how the family and the officers had to learn to co-habit even as the war is still raging and they do not speak the same language. I loved how the relationship and eventual love between Lydia and Jean-Philippe builds, like a slow burn. Kearsley shows how even during war, or despite it, people have the same fears, needs and compassion no matter which side they are on. She peels back the layers of their personalities during this highly conflicting time, which only adds to the pleasure of their relationship. There is a ghost in this story, which I tolerated as I do not like or read ghost stories. As with most dual timeline stories I have read, I seem to find one timeline more interesting than the other. In this case, the historical timeline or Lydia's story was more interesting to me, even as I enjoyed the present day story. I loved how Kearsley brings both stories together by the end of the novel and how she built the mystery of what really happened between Lydia and Jean-Philippe. Is there any truth to their tragic legend? If you are a fan of Kearsley's novels then you will enjoy this new story. If you are reading her work for the first time, this novel has her signature mystery/paranormal/historical richness evident in all her books. This was an enjoyable and highly satisfying read for me. A former museum curator, Susanna Kearsley brings her passion for research and travel to her novels, weaving modern-day and historical intrigue. She won the prestigious Catherine Cookson Fiction Award for her novel Mariana, the 2010 Romantic Times Book Review’s Reviewer’s Choice Award for Best Historical Fiction novel for The Winter Sea, was shortlisted for a 2012 RITA Award for The Rose Garden, and was a finalist for the Arthur Ellis Award for Best Novel from the Crime Writers of Canada for Every Secret Thing. Visit her at SusannaKearsley.com or follow her on Twitter @SusannaKearsley. I've never read this author but I do love a dual storyline so will look into this book. I really want to read some of her books, maybe I'll ask hubby for a book or two for mothers day, I've heard her writing is wonderful so it's awesome to see how much you admire her here. Did you read a lot of her books in the past? Yes, I've read several of her books in the past and have enjoyed every one of them. I hope you get to try them. I haven't read this author either, but I've heard really good things about her books. I'm definitely going to give her a go one of these days! It's interesting that you mention being drawn into one story over another in a dual-timeline novel. I always seem to find the past or historical story more compelling than the modern one. I'm not sure why that is, but it happens over and over. Weird, huh? I have enjoyed Kearsley and this sounds like another well developed story with her dual time line signature. Glad to know this was a winner for you.